Standing tall in the middle of the Montparnasse area of Paris, the Montparnasse Tower is an awe-inspiring structure. Construction of the tower began in 1969 and it was completed in 1972. For several years, the Montparnasse Tower remained the tallest skyscraper in the country, only to be surpassed by Tour First in 2011. From the observation deck of the tower, one can get a magnificent view of the city. Over the years, Paris has been regarded as one of the most picturesque cities in the world owing to its architecture and urban planning. Right from the ancient times to the 19th century, there was very little influence of international architecture in the city. Classism was considered to be the traditional style and therefore some of the major architectural influences such as Art Nouveau, Baroque, Modernist and Rococo had little or practically no impact on the construction work that took place in the city. Things began to change only after the Second World War when the Gaullist regime extended its support and even promoted the construction of such gigantic towers at the heart of the city. It is around at this time that the Montparnasse Tower was built. Work on the project was initiated as part of a redevelopment scheme for the area between Maine and Montparnasse railway stations. Initially, the tower was to be built to a height of 154 meters or around 505 feet. However, despite being approved by the concerned authorities, the height of the structure was later on increased to more than 200 meters. 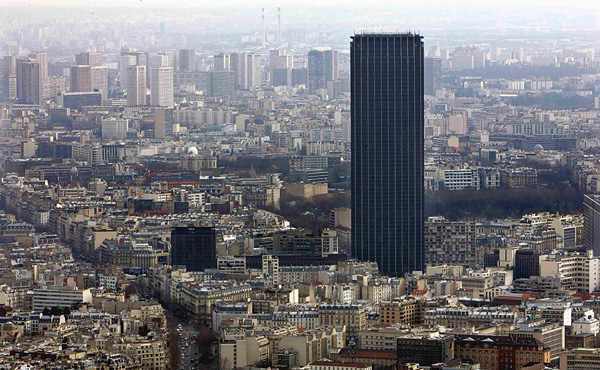 During its construction and in the years that followed, the Montparnasse Tower became a symbol of modern day Paris. The tower stands tall against the Paris skyline. The Tower has an observation deck on the 56th floor. The Tower may not be of interest until and unless you prefer visiting skyscrapers but you can definitely visit the site to get a magnificent view of the city from the observation deck. If you get lucky and happen to visit the tower on a clear day, you can see as far as 40 kms. At night, the deck offers a spectacular view of the Dome des Invalides and the Eiffel Tower, all lit up and displaying their magnificent splendor. You can also climb to the roof of the building on the 59th floor a much better view of the entire city. A visit to the Montparnasse Tower is definitely your money’s worth. This entry was posted in things to do in Paris and tagged Montparnasse Tower, Paris. Bookmark the permalink.